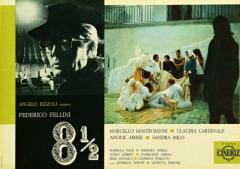 Guido Anselmi, a famous Italian film director, is suffering from the "director's block". Despite Anselmi declaring that this movie should be an easy one to make, he is having problems with his artistic vision, and in particular he does not want to tell lies on the screen. He’s blocked when shooting his new science fiction film, including some veiled autobiographical references, and he has lost interest amid artistic and marital difficulties. As Guido struggles half-heartedly to work on the film, a series of flashbacks and dreams delve into his memories and fantasies; they are frequently interwoven with reality. He is trying to relax in a spa after scoring success for his last film. He can't really have peace, however, as the people who have worked with him in the past are constantly asking for more work to do. He wrestles with his conscience, but is unable to come up with a new idea. While thinking, he starts to recall the major events of his life, and all the women he has loved and then abandoned. He’s a lot of stress, both at professional and personal level. As he works through these problems in the spa, and he thinks over his childhood. Both at the spa and/or on a film set he’s surrounded by many real people he’ll portray on screen, including his wife Luisa – he loves her but he does not fully understand their marriage - his mistress Carla, the antithesis of Luisa, and an actress named Claudia who, in his opinion, will be his ultimate salvation. "I was shooting Marcello’s profile but he has a double chin. Hence I put a plaster on this face and his double chin was all moved to one side of his face. He was very good to bear acting this long scene, namely the one with his father at the cemetery. [...] He was very patient with me and my crew. Make-up artists had prepared bags full of sand to alter his eyelids. I had told him he had to lose ten kilos. Then the hair stylist put white streaks in his air. Then, we had to change his hands: we made little hoods he had to wear to lengthen his fingers, but after a couple of shots the little hoods were blown away as if they were pencils. " 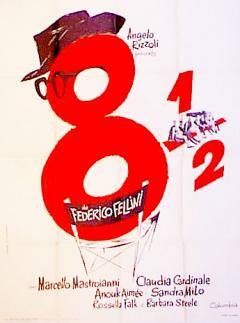 Otto e mezzo fully confirms - in case this needs any confirmation - that Federico Fellini is a master. Viewers are stunned by the film’s inexhaustible and torrential cascades of images. 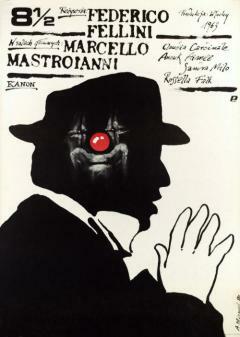 Fellini turns everything into images with extraordinary simplicity and honesty. 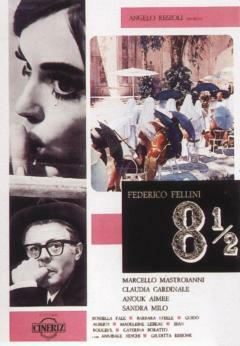 Fellini’s character Fellini is erotomaniac, sadist, a masochist, mythomaniac, afraid of leading his life, nostalgic of his mother’s breasts, as well as a trickster and a cheater. A few of his traits remind us of Leopold Bloom, James Joyce’s Ulysses hero, and Fellini has read and analyzed Joyce’s works. The film is a monologue alternating some real events. 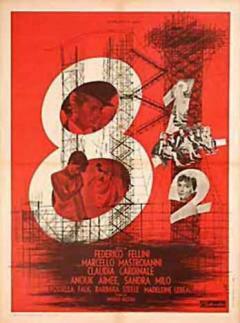 Fellini describes a neurotic approach to impotence very clearly. 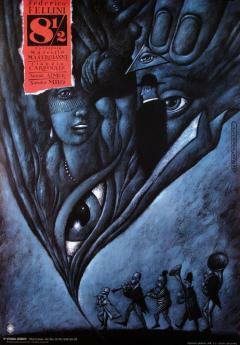 [...] Fellini's dreams are always surprising and original. It is for this very reason the two childhood episodes set in the countryside of Romagna and the one showing his first meeting with a woman on the beach of Rimini, as an adolescent, are the best of the film and fall within the best episodes in Fellini’s works. ‘The beauty of the film lies in its confusion … a mixture of error and truth, reality and dream, stylistic and human values, in harmony between Fellini’s film language and Guido’s incoherent thoughts. 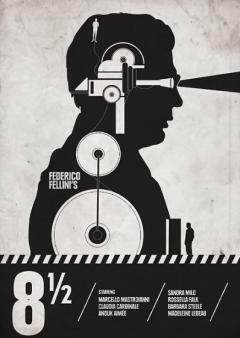 It is impossible to distinguish Fellini from his fictional director. 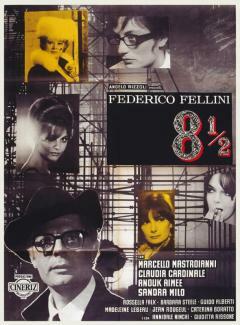 Consequently, Fellini’s faults coincide with Guido’s spiritual doubts. The osmosis between art and life is amazing. 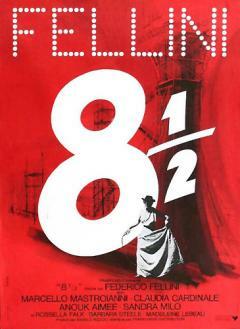 It will be difficult to repeat this achievement … Fellini’s genius shines in every single detail in this film, and this is a rare event in film-making. There isn’t a set, a character or a situation that doesn’t have a precise meaning on the great stage of Otto e mezzo. 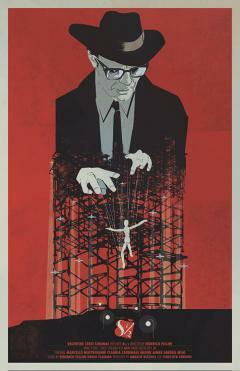 This film is a milestone in the history of the fictional film. La dolce vita - with its block-based structure - indicated a significant path both in film-making and literature. Otto e mezzo, however, moves forward towards experimentalism. 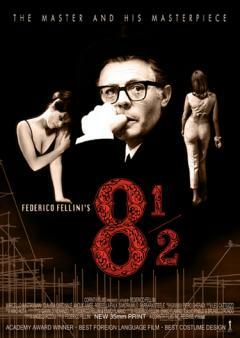 In this film Fellini looks ahead, imagines the future, and analyzes the problems experienced in living, writing, and relating to the outside world. Otto e mezzo is an amazing film. Fellini made here an effort to describe his own psychological attitudes and he thus made a dangerous and astonishing step forward. 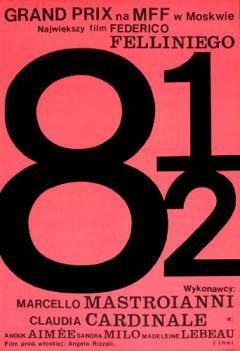 He had to invent a new, soft and flexible film language, and he succeeded. 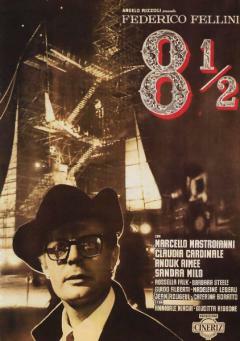 This is one of the most stimulating and interesting experiments made in the Italian film-making industry. He has been able to eliminate the boundaries existing between reality and dreams.